With my bike booked in for its 600 miles service on Wednesday, I needed to get to about 540 miles this weekend (it is 30 miles each way to work, and Monday is a holiday). I start with 375 miles, after the previous nights trip to Stanton St John (just north of Oxford) to meet up with Gene Rankin in the Star. As the bike is new, I wanted to ride familiar roads. 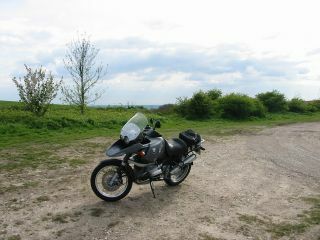 So I set off on my old commute, down the A33 from Reading to Basingstoke. To my disappointment, but not surprise, the 50MPH limit has spread all the way from the end of the dual carriageway to Basingstoke. This in the six months since I changed jobs. It used to only run half way, and it wasn't that long ago that it was all National Speed Limit. 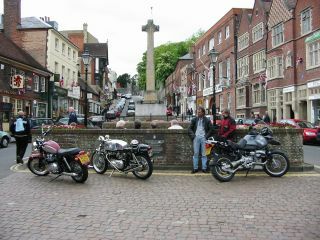 At Basingstoke, I headed down one of the area's great squid roads, the A339 to Alton. This road starts of quite tight and twisty (for a major road) and then opens out into a series of open straights separating high speed corners. 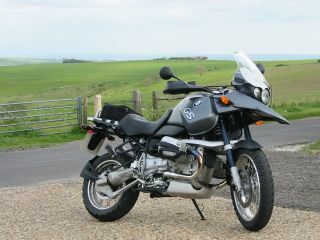 It is a favourite for Zen motorcycling (becoming one with the scenery). I had to work quite hard to keep my eyes on the road as I passed the Gliding Club at Lasham and not watch the glider that was landing. Through Alton and out, past Jane Austen's House (in Chawton), on the A32. Another open road with wide sweeping bends and small country villages. 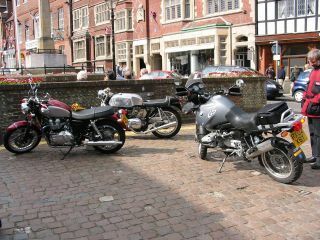 The first of these is Lower Farringdon and the BMW bike only dealership of SPC. Many years ago I stood on their forecourt and watched the Tour de France go by on it's last visit to England. 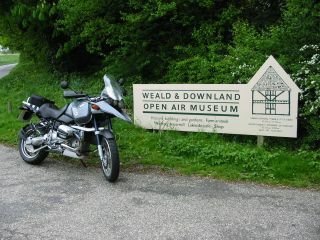 The A32 drops down to the A272 and as I get closer to this, one of the South of England's most popular motorcycling roads, I see more and more bikes. Stopped at the lights on the junction, there are bikes everywhere, running both ways along the A272, turning into or out of the A32 (often cutting through the petrol station to avoid the lights) and parked up in the Little Chef (a large chain of roadside cafe's serving ghastly food to the undiscerning travelling public, famous for its pre-cooked and microwaved omelets). I turn left onto the A272 towards Midhurst (where I used to live as a small boy - many years ago). 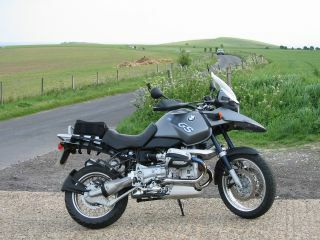 Like many really popular motorcycling roads, the roads around it are better. 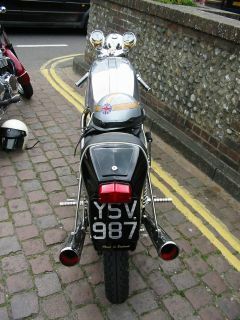 It is also heavily policed, as there is even more Zen motorcycling here. The traffic is often heavy, today is no exception, and safe passing places few and far between. After a quick sojourn onto the A3 (a motorway in all but name) to by-pass Petersfield, I follow the A272 through to Midhurst. At this point I could continue on through Petworth (with it's famous Elizabethan House) to Pulbourgh, then down the A29, and over Bury Hill to Arundel. However, at Midhurst I turn off onto the A286 towards Chichester and through the delightfully named Cocking. From Singleton I take the back roads over the downs past Goodwood race course (horses), Goodwood house, Goodwood raceway (cars and bikes), and Goodwood airfield. I join the A27 just east of Chichester, and turn east towards Arundel. This bit of road is dual carriageway, and with the exception that it passes by the site of a famous Battle of Britain airfied; Tangmere (where once I flew gliders with the Air Cadets). At Fontwell (another famous horse racing course), I decide I have had enough dual carriageway for now, and turn north up the A29 towards Pulborough. Fontwell is the reason for the rather odd roadsign I noticed when I joined the A27: "The Racing of Horse Drawn Vehicles is Prohibited." Something I have seen on that stretch of road in the past. 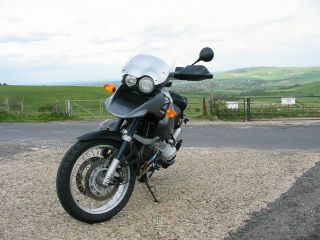 The A29 runs back into the downs, and although it is all now 50MPH limit, I enjoy riding the familiar sweeping bends running up through the hills. 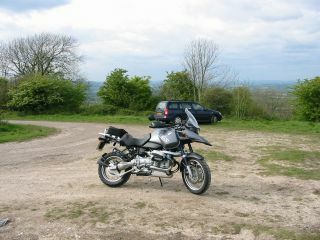 At the top I have the choice of continuing along the A29 and down Bury Hill (another motorcycling favourite), turning off towards Houghton, Amberley and Storrington with a nice run along the north edge of the downs, turning back towards Arundel, or stopping for a coffee in the car park at the top. As usual, the car park is full of bikes, and I am not feeling particularly sociable, so I turn right, back down the south side of the downs towards Arundel. Well, I like Arundel. Arundel is a small city (the castle is bigger than the city) perched on the south side of the downs. It is a city because it has a Cathederal, but is probably no larger than it was in Medieval times. Originally there to protect the Arun river, it is the ancestral home of the Duke and Duchess of Norfolk (the Fitzallan-Howard's) the only Catholic nobility left in England. It was This has lead to a oddity in England, a church that is both Catholic and Church of England (CofE). Half inside the castle walls, and half outside, next to the (CofE) Cathederal, is the Parish Church of Arundel (CofE), it is also the family church of the Norfolks (Catholic). The two halves of the church are separated by an iron screen and have only been, officially, opened once in the past 300 or so years, to let the Queen through for a special ceremony. The church is also notable for being the place where Cromwell mounted his cannons to bombard the original castle during the Civil War. He is also said to have stabled his horses in the crypt. As the original castle was mostly destroyed, the current castle is often decried as a huge Victorian fake, however, I still love it. Much of it is open to the public and as you walk around you can feel that, unlike many of the Great Houses, this is a much loved and very much lived in home. You really do get the feeling that the family have just stepped out of the room as you entered. 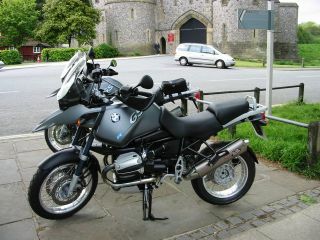 Today though I only stop for a photo of the bike by the castle. 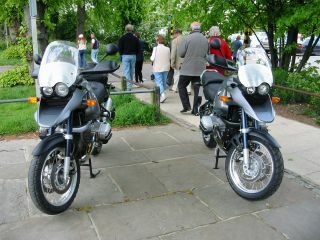 Parked up next to the river is my bikes twin! 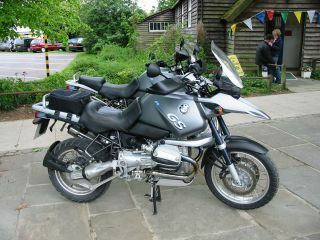 This one with a standard seat, Remus exhaust (no catalytic converter), and only 101 miles on the clock! I just have to take a picture of the two together. 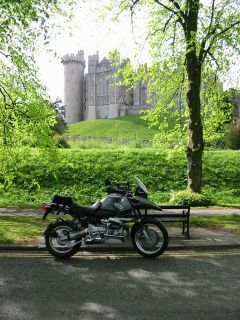 The best view of Arundel Castle is as you approach the town from the east, along the A27. 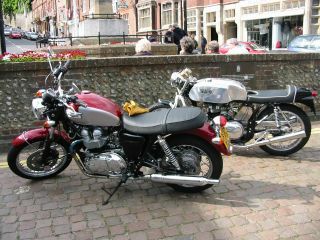 However, I don't feel like going that way today, so I head back up through the town heading back for the A29, when I spotted a rather lovely Triton parked up on the city centre. With less than a hundred miles since building it, the owner was out on its shake down ride. 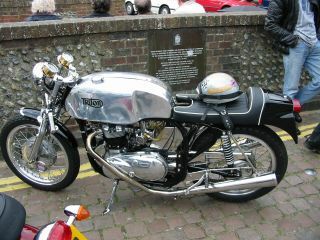 It was accompanied by a modern Triumph Bonneville. I took some photos and then headed back off up the hill towards the A29. At the top of the hill I decided to forgo Bury Hill, again, and turned down the B2139 to run along the north side of the downs, heading east. The road runs down to the river Arun at Houghton bridge, about three miles inland from Arundel. The old stone bridge crosses the river here via a small island. The river here is still tidal, and on exceptionally high tides the arches can be underwater. There is a tea shop along side the river here where we often stop in the summer. After the bridge the road runs past the Amberley Chalk Pits, and Amberley Working Museum. Another great place to visit on Summer weekends, this industrial museum has many working exhibits from printing presses, light railways, old busses and steam engines through to a concrete museum and potteries. They even filmed part of a Bond film here (A View to a Kill). Not wishing to stop so soon, and with my next destination in mind, I continued on past Amberley Castle for a couple of miles, then turned off south onto an single track road running up onto the downs. 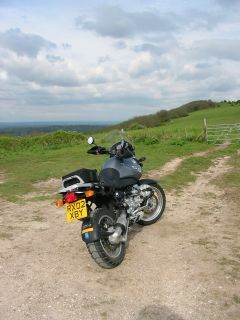 The road runs up to a car park on top of Kithurst Hill (pronounced Kit Hurst) next to the South Downs Way. From here you can see the whole of the Sussex Weald to the north, and south to the sea. Gliders from the nearby Southdowns Gliding Club at Storrington use the updraft from the downs here to stay aloft for hours. From Kithurst I continued on through Storrington on the A283 to Washington. Here I could either head south back over the downs on the A24 to my old home of Worthing, or straight on and over the downs behind Steyning. With the excuse that I would probably be coming back up the A24 and not wanting to double back on myself that much headed for Steyning. This is another of the picturesque small old towns that litter the Sussex Weald. It has the benefit though of a small single track road that that winds up through the downs behind it to come out almost unnoticed on the A27 just west of Worthing. I stopped off at the top of Steyning Bowl, where odd people like to throw themselves off the side of the hill (with a hang glider or parasail), for some photo's. 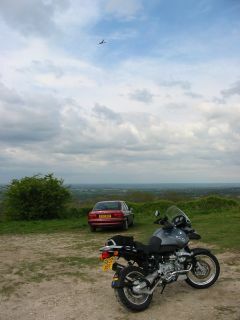 Here again, you have a great view of the Weald to the north, and the sea to the south. 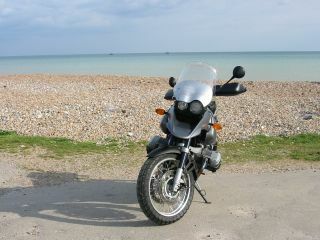 After taking a few photo's, I continued on south off the downs, and through Lancing to the sea. On the Coast Road (A259), I turned West through Worthing, past the old Dome Cinema, where they filmed Wish You Were Here, the Pier and along past my old flat. I followed the coast road, through Goring and it's lawns of picnickers and kite flyers and stopped at a small car park just before Ferring for more photo's. The A24 runs up past Partridge Green where I also used to live towards Horsham. It is all dual carriageway, and although the bike is capable of law breaking speeds (it has to be doing about 90MPH to get it into 6th gear if I'm not to 'lug' it), I'm not really happy at those speeds with so few miles on the clock. So it is a relief when I get to Horsham and on the A281 towards Guildford. In my first year at University I was living in Halls. 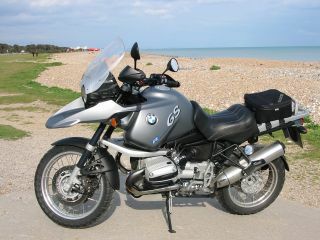 On Friday evenings I would ride down to Guildford pick up Kate on her R65, and we would ride down the A281 to spend the weekend in Worthing, returning Sunday evening. The road itself is a moderately fast main road with some great corners, and some fun dips, along it. By this time, the sun was getting close to the horizon and it was all very familiar. From Guildford the road (A322) is very boring, with the only saving grace, the road past Brookwood cemetery, now reduced to a 40MPH for most of its length. Up through Bisely it is, and has been for many years, all 30MPH. Finally it turns into dual carriageway shortly before it crosses the M3. 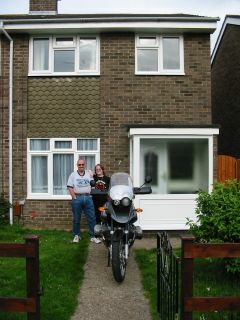 From then on to home, I'm on my daily commute, past Bagshot, Bracknell and Wokingham to Reading. One abiding memory from this trip is that everywhere the woods were full of Bluebells. Or rather everywhere it was not safe to stop. Everywhere I could stop, there were none to be seen.